Hello world! Is it as cold everywhere as it seems to be here in Alabama. Just as I thought we were in the clear for warm weather on the big day, here we are again with freezing warning! And the rain...lets not even go there today. We are officially counting down the days. These are from the Lingerie party and the Bachelorette party. Kristin and my Bridesmaids hosted both and they were so much fun. A little embarrassing, but fun! The tables were beautiful! 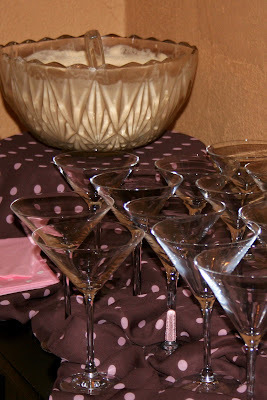 Everything was pink and brown...classic lingerie colors! My mother will probably email me soon, asking me to take this picture down! But its the lesser of the evils I can assure you. These; however, are my favorites! From none-other than my GRANDMOTHER. 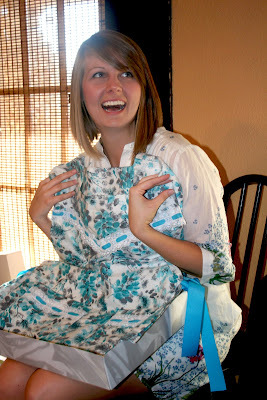 This is not lingerie,its an apron! 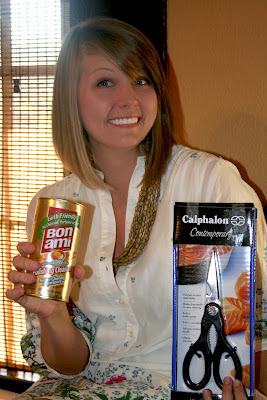 But wait...this is even better, Bon Ami and Scissors! NO WORDS. Not to mention I wasn't really sure what Bon Ami was! So I was a bit concerned. Until, of course everyone explained that its for cleaning your flat-top stove. And the scissors? Everyone needs a good pair of kitchen scissors! Did we forget to tell Mary Lee that this was a Lingerie shower, and not a kitchen shower? But the funniest part of this whole story, is that Cory and Josh had to come in the house to pickup Ella and it just so happened to be at the moment I held these products up. And you thought I was concerned!! Cory's face was beet red! 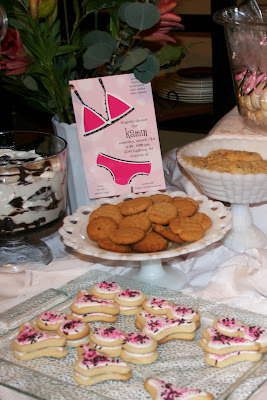 Did I mention yet that this was my Lingerie Shower?? I really hate that I missed this one! Man, I was gonna get you a pair of scissors! By the way, I saw the 2 images on Sarah blog of your bridals....love it. Can't wait to see your beautiful self Saturday. I know. It was so funny. I hate you missed it too! =) Yay. I can't wait to see you too. Don't let me miss you!